Rescue the kingdom and the princess in Hyrule from the invasion of the prince of darkness in The Legend of Zelda. Gather the fragments of Triforce Wisdom to gain the power to defeat Ganon. The Legend of Zelda is an action-adventure video game developed and published by Nintendo on 1986. 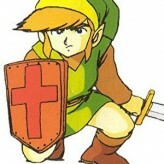 In this game, you will control a young man named Link who wears a green tunic and a pointed cap. The story of the game begins when Ganon and his army conquered the kingdom to acquire the power of Triforce Wisdom but Princess Zelda splits it into eight pieces and hides it to dungeons. Before the princess is captured, she commanded Impa to find someone brave that will save the kingdom. Help Link in his legacy to save Princess Zelda and the kingdom! The Legend of Zelda is an online NES game that you can play at Emulator Online. This free Nintendo game is the United States of America region version for the USA. The Legend of Zelda is a single title from the many adventure games, action games and zelda games offered for this console. If you enjoyed playing this, then you can find similar games in the nes games category. The Legend of Zelda game is from the various retro games on the site, and there are more games like this, including The Legend of Zelda: Ocarina of Time, The Legend of Zelda: Majora's Mask and The Legend Of Zelda: A Link To The Past.